Historically, Anderson has emphasized engineered flooring for its durability, efficiency and versatility. Perhaps that’s because Anderson invented it. Cross-Locked Engineered® was first developed by Anderson’s founder, L.W. Anderson, and is still used today as the industry standard. The construction method alternates the grain direction of five separate wood plies to create a product that rivals the strength of steel and uses half as much raw wood as solid floors. This innovation allowed wood floors to be glued down directly to a concrete slab for the first time. Anderson continues to be an industry leader in hardwood innovation today. 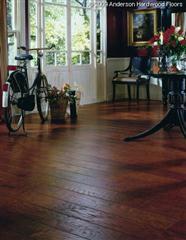 In 1997, Anderson introduced the first aluminum oxide high-wear wood floor finish. And in 2009, Anderson debuted the revolutionary Luster-Lock® Ultra finish. According to research, Luster-Lock is up to six times more resistant to scuffs and abrasions than competitive flooring products and gives today’s busy consumer peace of mind regarding the durability and life of her Anderson floor. Don't see the Anderson product your looking for? Call 407-925-0917 for DIRECT PRICING!! !